France/US, 1953, 104 minutes, Black and white. Kirk Douglas, Dany Robin, Barbara Laage, Robert Strauss, Gabrielle Dorziat, Brigitte Bardot. 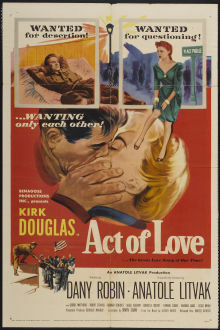 Act Of Love is a moving love story with a World War Two Paris setting, filmed in Europe. Direction is by Anatole Litvak, who directed many films in Hollywood in the '30s e.g. All That Heaven Allows. He was to continue his career with such striking	films as The Snake Pit. In the '60s he was to make The Night Of The Generals. Kirk Douglas and the French Dany Robin star and are very effective in this sad and moving story. 1. What was the main impact of this film? Audience emotional response? The quality of audience involvement? 2. The significance and tone of the title? Its relation to the them, and the irony with war? 3. Comment on the quality of the black and white photography, the musical accompaniment, the war atmosphere of the film, the atmosphere of Paris during the war and its aftermath, the atmosphere of sadness and the impact of this on audiences. 4. How successful was the flashback technique? The modern background and the pathos of memory? The importance of the story affecting people years afterwards? The atmosphere of re-creating memory in the place of memory? The pathos of the flashbacks and the story? 5. How interesting a character was Robert? Audience possibilities for identifying with him? Kirk Douglas' style? As an American, a soldier, involved in the war, in liberation, his work in the office? What kind of man was he? The gradual involvement with Lisa? The importance of his choice to pose as Lisa's husband? What was the quality of his sympathy for Lisa? Why? Providing a how for her and support? Why did he grow in love for her? The importance of his seeking permission to marry? The impact of the refusal. the need to defy authority? The effect of all this on his life? His return to France and his memory of Lisa's name? What insight into an American soldier in a war experience discovering love? 6. How attractive a character was Lisa? The pathos of her first appearance. her continual sense of being lost and bewildered? The possibility of a home? Her attachment to Robert? Her being welcomed by the family, yet attacked by the son? The continual oppression, papers, the prison experience and its detail? The importance of the marriage for her? The sadness of the phone call? How credible was her death? How sad and moving for the audience? The insight into a displaced person in war? 7. The importance of the family in the film? Their effect on Robert? On Lisa? As portraying the Parisian background? 8. Audience response to Robert's seeking permission from the officer? His casual refusal? His reappearance at the beginning of the film and at the end? The irony of his effect on people's lives? How responsible was he for unhappiness and death? 9. The ordinary soldiers and their helping one another? The soldier waiting at the square with the pass? 10. The film's use of the accidents of life and fate? The theme of fate and unhappiness? 11. Themes of sorrow and suffering? How well portrayed and explored? 12. The theme of love and its quality and effect on people's lives? 13. How impressive a human film was this? Its qualities as a film? Its impact in the early '50s? Now?